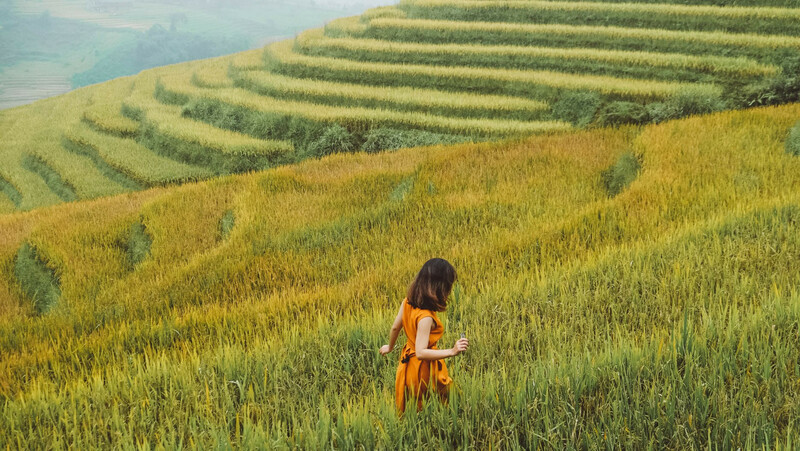 The vivid picture of the vast terraced rice paddies in Vietnam by the hard working passionate farmers has become a very interesting option for anyone who’s vacationing in the country. 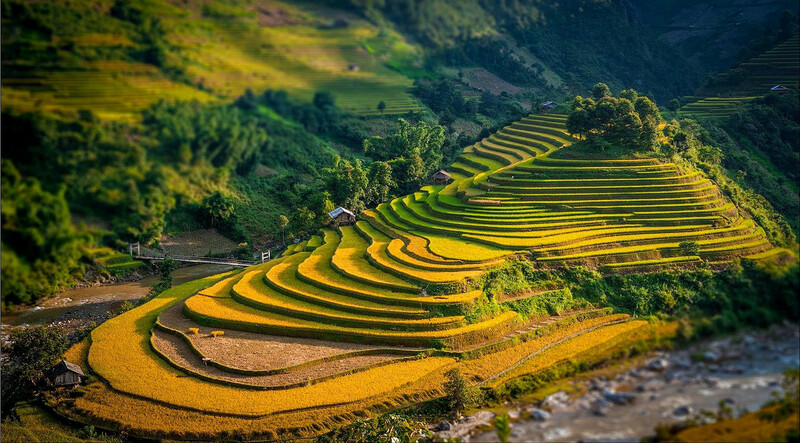 Bellow, we gathered top most beautiful and sometimes lesser known places you can travel to see the amazing rice terraces in Vietnam. Ha Giang will pop up in your mind looking to find out about the most beautiful rice terraces in Vietnam. The rice paddies here are cascading and stretching along the other side of the mountain. On each occasion, professional photographers will come from a ll around the world to capture the amazing rice paddies. This picture was taken mid-September when the rice is still not ripe. Late September will be the best time to look at the Ha Giang rice terraces when the yellow color covered the hillsides. 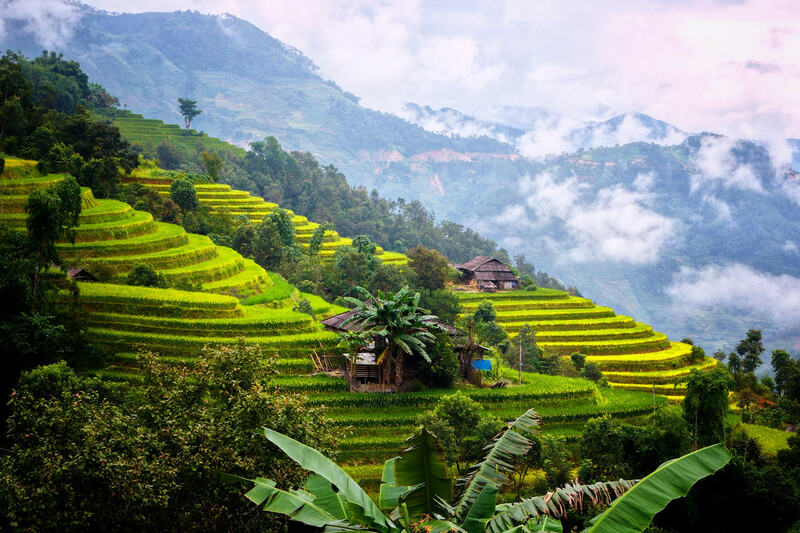 In Addition to Ha Giang, Hoang Su Phi hamlet with its beautiful rice terraces is the most famous rice terraces and a hunting spot in Ha Giang area. It’s not easy to get to Hoang Su Phi, you will have to cross the spectacular Mã Pí Lèng Pass. Despite the bumpy road, you will have the vast area covered with ana amazing cascaded rice terraces which you will not see it anywhere in Asia, a big smile is guaranteed. 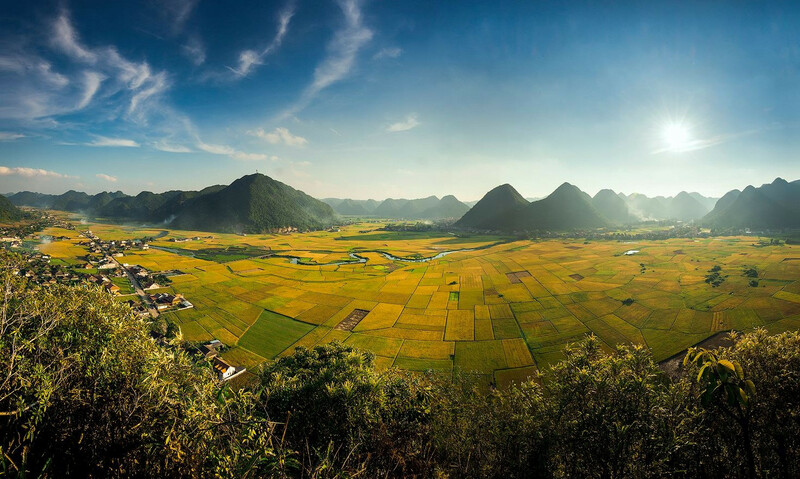 Located about 160 km from Hanoi, Bac Son Valley (Lang Son) is also a great place for you to admire the poetic landscape with the great rice fields in northern Vietnam. The rice paddies you see in Bac Son are growing in different time because they have different harvesting time. The combination of the green paddy fields and ripe form the colorful spectrum will make an interesting mix throughout the valley. 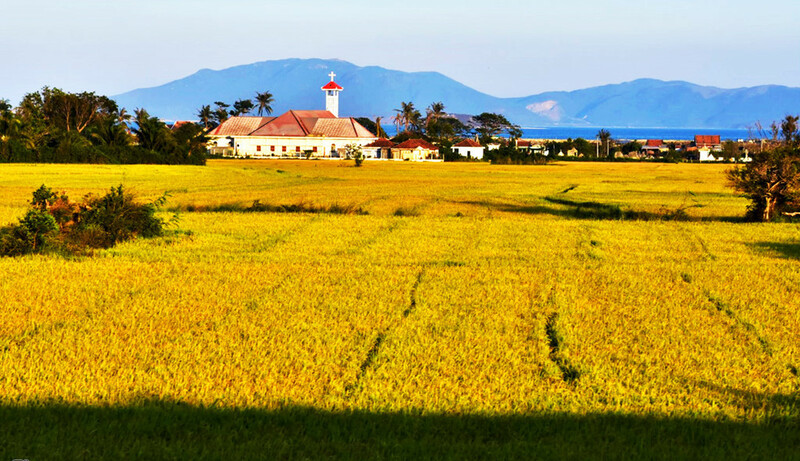 The appropriate time to look at rice in Bac Son / Lang Son is mid-November. 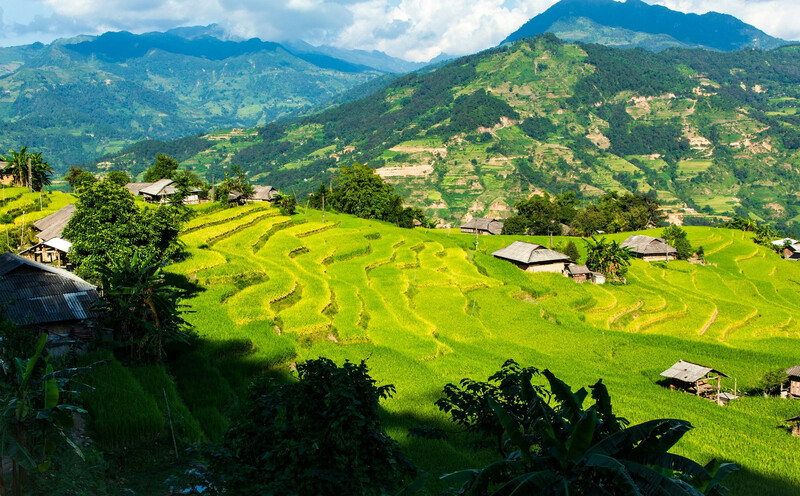 Lao Cai, located in the Bat Xat district together through the Y Ty pass is where beautiful rice terraces attracts tourists. This mighty mountain land possesses meandering fields like hundreds of captivating golden waves that give you a completely different feeling. 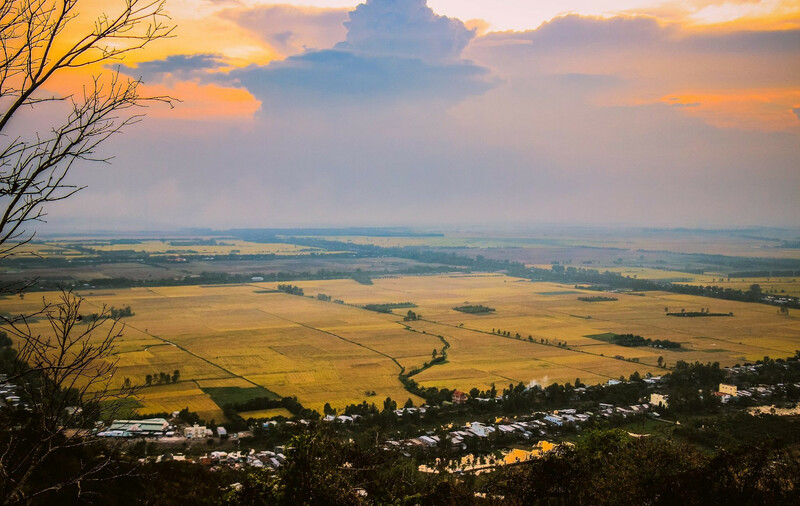 In addition to Y Ty, Bat Xat district, you can also drive through the mountains to find other beautiful and less visited rice paddies in A Lu, Ta Cu and Ma Sao communes. 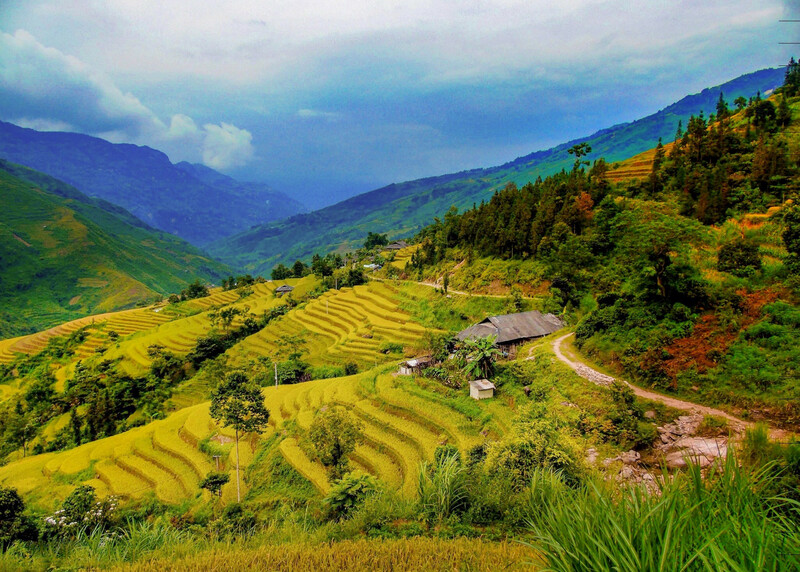 Another familiar name in the tours of Vietnam, Sapa, where terraced rice paddies will capture anyone’s eyes. 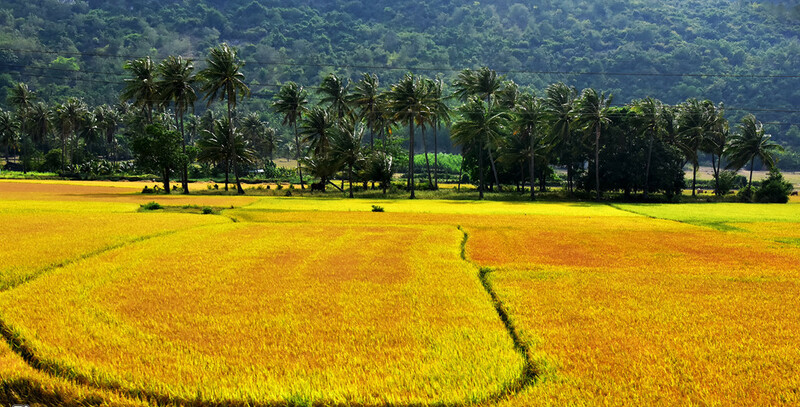 Come and explore the harmonious beauty and golden rice in the mountainous scenery. Dont look further if spotting the most majestic place to photograph the rice paddies in Vietnam is what you are looking for. The Mu Cang Chai (Yen Bai) will stand at the top of the lost, the area is located right at the foot of Hoang Lien Son, Mu Cang Chai terraced fields is like the keys to the graceful sky. 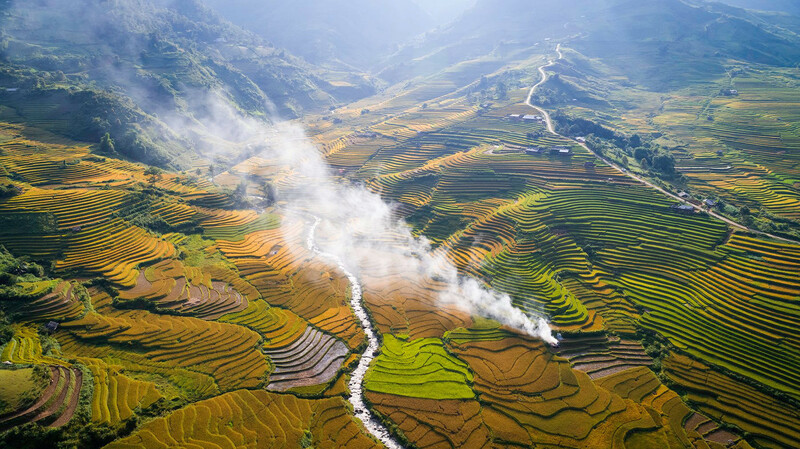 Come to Mu Cang Chai in September, you will see the the golden ocean of rice terraces, Also, that is the time to see the splendor vibrant of the harvest season. Not as magnificent as Mu Cang Chai, Tu Le valley (Yen Bai) with a beautiful rice terraces will bring peace and beauty to the area. Just look at the photo and i am sure you will feel the serenity and shocking beauty of the rice fields. 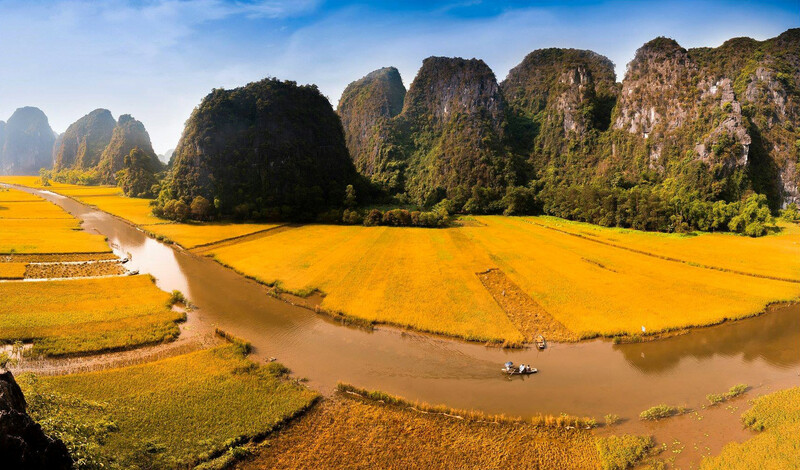 Tam Coc – Ninh Binh, when you drive about 100 km from Hanoi, you will completely admire the wonderful scenery of the golden rice fields in Tam Coc during the weekend. Ta Pang rice field in the Tri Ton district of An Giang province is one of the most beautiful rice fields in the Mekong Delta and southern Vietnam. Step into the romantic rice field is very simple and rustic here, you feel the peace as it is back to the childhood years. 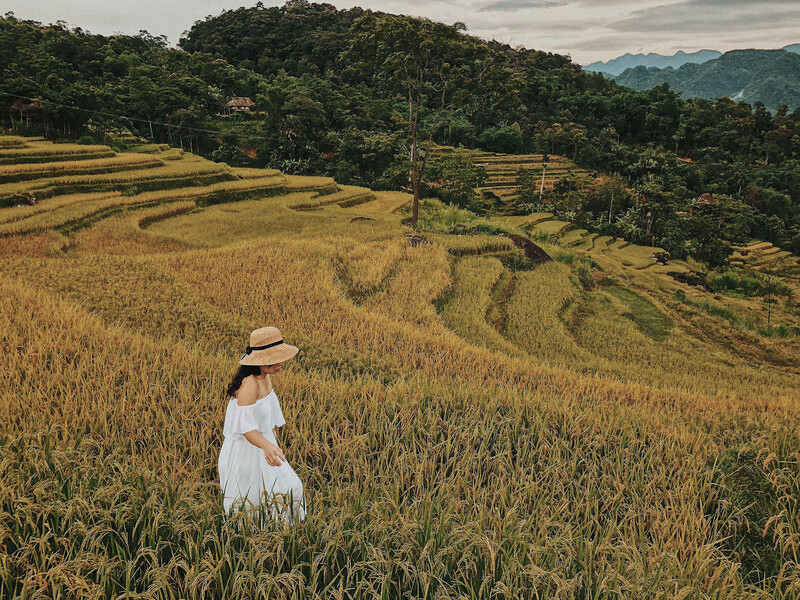 Ta Pa is not only a destination for hunting beautiful rice terraces but also help you get rid of all sorrow, indulge in the peaceful nature through the simple yet amazing typical sceneries of of Southern Vietnam.